Russia held US Treasury bills worth $66.5 billion as of April this year, according to the latest monthly report from the US Treasury. That compares with the $116.4 billion held a year ago. 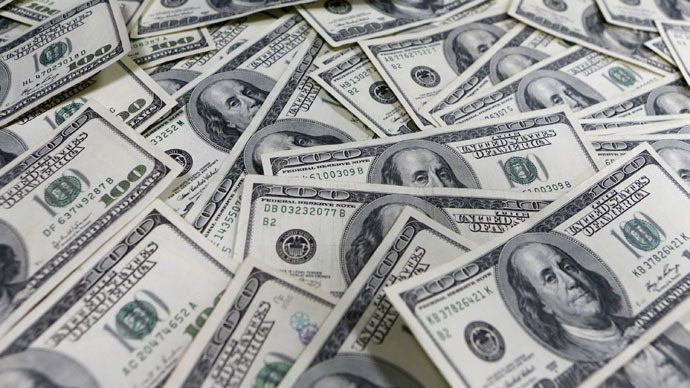 From March to April 2015, Russia sold $3.4 billion in US Treasury bonds,reportedUS Department of the Treasury Monday. Since August 2014, the value of US bonds in the Russian government portfolio has been steadily declining and the volume of Russian investments in US bonds dropped dramatically. Russia is now only 22nd on the list of the major US debt holders, compared to twelfth place in April 2014. The Western sanctions imposed against Russia last year over re-unification with Crimea and its position in Ukrainian crisis have pushed Moscow to cut its dependence on the US dollar and build a more self-sufficient financial system. Western sanctions have encouraged Russia to work more actively with Asia, as the Asia-Pacific region and BRICS, as they make up 60 percent of the world GDP, said Russian Prime Minister Dmitry Medvedev last week. The BRICS summit in Russia this July will see the opening of the $100 billion New Development Bank, intended to compliment the World Bank and sponsor infrastructure projects within the group. Another project to be launched is currency pool worth another $100 billion, expected to guard the group from exchange rate volatility, said Russian President Vladimir Putin in May. More than 40 countries and associations have said they would like to boost trade with the Russia-led economic block known as the Eurasian Economic Union (EEU). Vietnam became the first country out of the EEU to sign a free trade zone deal with the block in May and is considering switching to local currencies in bilateral trade. Russian Prime Minister Dmitry Medvedev said Moscow was ready to consider a currency union across the EEU. Russia’s largest bank, Sberbank, issuedits first credit guarantees in yuan this June, which marked another step in its de-dollarizing policy. Yuan-ruble trade in Russia has grown 800 percent between January and September 2014, and accounts for 7 percent of bilateral trade, with a huge potential to grow, according to May data. China and Japan are the biggest holders of US Treasury bonds, four times as much as held in the Caribbean Banking Centers (a tax haven than includes Bahamas, Bermuda, Cayman Islands, Netherlands Antilles and Panama). As of February, Japan officially held more US debt than China, when Beijing disposed of $15.4 billion in debt. However, in March-April Beijing boosted US Treasury debt by $39.7 billion, which reached $1,263 trillion and ousted Japan, holding $1.215 trillion worth bonds, from first place.